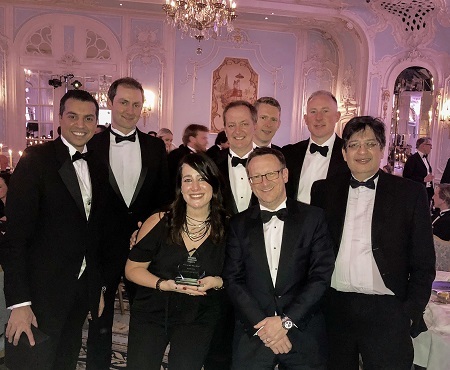 LONDON – Abu-Ghazaleh Intellectual Property (AGIP) received the Middle East IP Firm of the Year award for 2018 at the Managing Intellectual Property (MIP) ceremony recently held at the Savoy Hotel in London. According to MIP, the awards recognize the achievements in IP work over the past year, whether in prosecution, litigation, licensing or other fields. They mark the culmination of MIP’s five month-long annual world survey of the world's leading IP firms. AGIP earned this regional recognition, for the 9th time, for their outstanding IP practices in the Middle East, and their continuous efforts in providing their clients with the best-quality services in the field of IP protection. Ms. Dima Naber, AGIP Counsel and International Business Development Executive Director, and Mr. Amro Hattab, AGIP Jordan Office Manager, accepted the award on behalf of AGIP. “We are very proud to be recognized this year for our outstanding work in the field of IP as the Middle East leading IP firm under the guidance of H.E Dr. Talal Abu-Ghazaleh.” Naber said. Meanwhile, Hattab commented on this achievement saying: “This recognition further validates AGIP's commitment to developing both innovative and quality services". MIP's survey was the largest and most in-depth ever; it covered both prosecution and contentious work in 65 jurisdictions including the Americas, Asia and Europe. AGIP enjoys an international reputation for excellence with offices throughout the Arab countries, in addition to India, Turkey, Pakistan, Iran, Russia, China, Nigeria and Afghanistan, and an extensive network of 180 liaisons and correspondent offices worldwide. Managing Intellectual Property (MIP) was founded in 1990 and is now firmly established as the leading international magazine for IP owners. MIP is published 10 times a year and includes news, data, in-depth articles and interviews with influential IP figures.